Cadbury Creme Eggs are now available. These chocolate eggs are out most popular candy when it comes to Easter candy. A milk chocolate egg with a white and yellow egg looking center. Although this yummy treats may look like a egg yolk believe me that taste nothing like an egg. Cadbury eggs are a must have treat for filling your Easter baskets. They are strictly and seasonal candy that will appear in mid January and are usually available through early April. 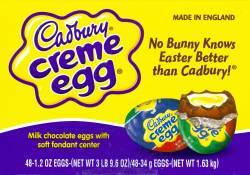 However due to the demand they never last that long and are one of the first Easter candies to sell out. Did you know that when making a cadbury egg they are actually made in two separate pieces ? These are actually a molded candy, however due to the processing you never really see the seem. First the milk chocolate is poured into the molds, once somewhat cooled the white filling is added and a dab of yellow then they are placed together quickly to let the remaining cooling process mold them together. Unlike most Easter candies that have pastel spring looking wrappers these are wrapped in bold colors of red, blue, green and yellow. In the UK these are manufactured by Cadbury, but here in the United States they are marketed by the Hershey Candy Company. You can buy cadbury creme eggs individually , but for those of you who love these eggs and want to stock up so you can have them through out the year you can also get them in a 48 count box at O'Ryans Village. Make sure to buy them early as they will sell out quickly.